Brake inspections or repair, we strive never to stop short of excellent service. 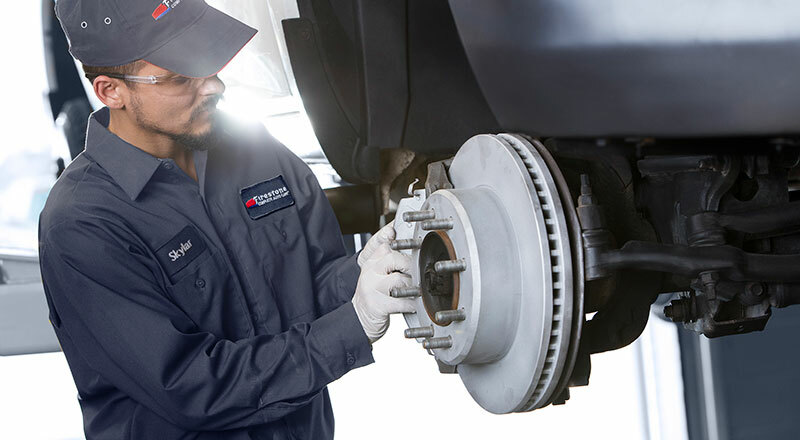 Visit Firestone Complete Auto Care near you for the right brake service in Cleveland Heights. Do squeaky brakes, a spongy brake pedal, or less stopping power have you searching for brake specialists near you in Cleveland Heights? Firestone Complete Auto Care is where you want to go to get brakes for less than other shops. Thanks to our easy-to-download brake coupons, you can spend less on the brake repairs and services you need to drive safe from morning to night. But when should you stop by? Watch out for signs! Certain sounds and smells can signal imminent brake problems. Grinding or squealing can mean your pads and shoes are too worn. Vibration or pulsation in the pedal or steering wheel when braking are common indicators that your brake pads need inspection. Whatever the issue, it’s best to stop by for a brake check before things get worse, as you could damage other parts of your braking system. Head to Firestone Complete Auto Care a complimentary brake check in Cleveland Heights, at a time that works for your busy schedule. You can expect that our technicians will measure pad, rotor, and drum wear, in addition to checking the health of your parking brake and brake fluid. Then we'll walk you through any services that may need to be performed, like brake pad replacement, rotor and drum resurfacing, brake fluid change, or replacement of brake lines. Whether you need new pads or hoses, you'll find that we're the right option for affordable brakes. We perform nearly one million brake repairs every year! Make sure that when you hit the brakes, you don't hit anything else. Book an appointment at Firestone Complete Auto Care for brake service in Cleveland Heights at the first sign of squeaky brakes, low brake fluid, or a loss of stopping power. Many of our locations have extended evening hours and are open on the weekends to make repairs more convenient. Find your nearest location and invest in your safety today! From state inspections to steering and suspension to brake repair, rely on your nearby Firestone Complete Auto Care for your car or truck maintenance and repairs. We're your local car care center, tire store, and automotive shop combined into one. Our highly qualified technicians care about keeping your vehicle running newer, longer. When you need work done on your car or truck, we will strive to make your visit satisfying. Experience the difference and book an appointment online for auto service in Cleveland Heights, Ohio today.